mardi 12 février 2013 , par Patrick L.
SENA Technologies chains new products at full speed. After the Smh5, here is the Smh5-FM. We tested it for you. For wwho knows the intercoms Sena, it is not a surprise. At the opening of the box, there’s still that good smell of electronics that invades your nose. Smh5-FM is no exception to the rule. The box is also soberly and elegantly presented. The reduced dimensions of 21.5x13.5x7 (Lxwxh) of the box make you can bring it anywhere with you, if you are maniac and appreciate particularly tidy things. As it is the case with the Sena Smh5-FM. Inside the box, there is a first level which has cavities for storing the microphone and electronic modules. Once the tray is removed, a schema shows you the content of the box. two set of sticky Velcro for speakers, other micro... and two allen keys. The pack is Dual, it is not for nothing ! For the anecdote, we just released to photos. Put everything back in place is another story, there are many elements, in a space limited after all. 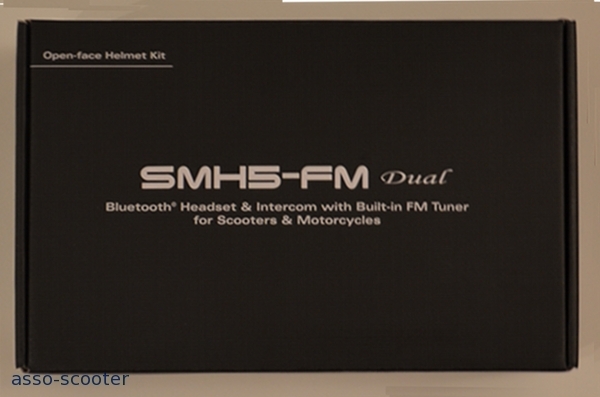 For the most distracted on the side right, Sena recalled the main features of the Smh5-FM. No doubt to have. On the other side, labels recall serial numbers of electronic modules. It is clear, net. The clamp has to be preferred to the sticker support. With this one, and even if the Smh5-FM is light, there is always a risk of detachment and therefore fall. Annoying when you ride. The clamp is now made of metal. This has several advantages. It is stronger than the plastic one and allows to have a lesser thickness to slide between the helmet and the trim. Now that each element is independent - micro-high speaker-clamp - you just have to drag each of the components under the trim of the helmet, before any clip on the electronic module. With the Smh5-FM, Sena has further improved the system. 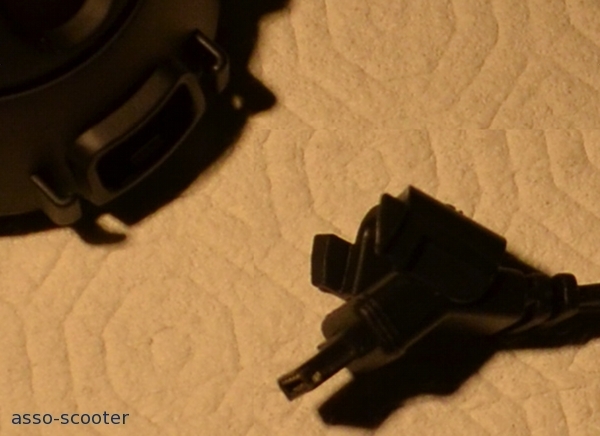 Once the connector on, it is necessary to lower a small component that will end up joining the set. It remains to check the position of the speakers before definitively tightening the clamp. 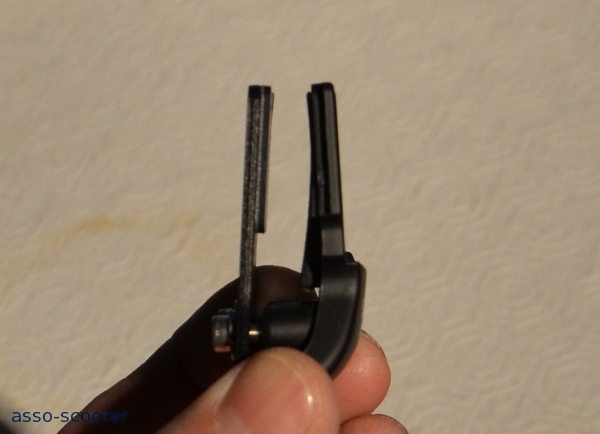 The electronic module just slide along the clip and no risk of losing. The movement is done from top to bottom and in this case, no risk that in the underseat storage an object pushes it outside its place. What happened to us with another brand. The thickness and small volume of the electronic module make that you do not need to remove it in case you have a narrow underseat storage. 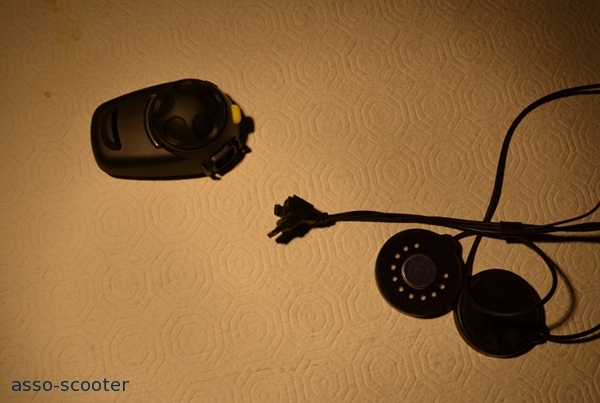 To charge the module, it is necessary to approach the helmet of an electrical outlet, or remove the module form the clamp, after having disconnected the plug... It is less convenient than the Smh10 but it is also because we have to find something to complain. Radio, what for ? 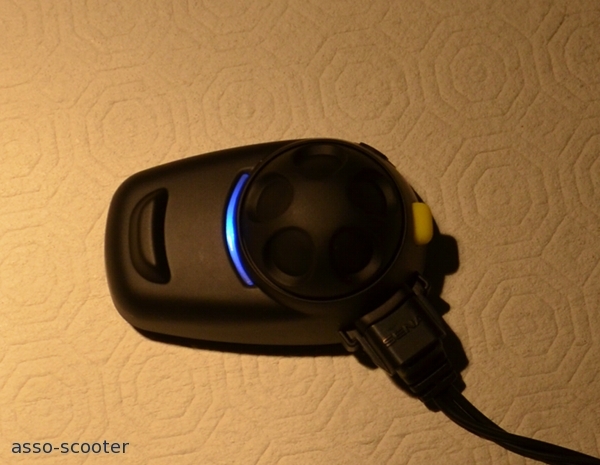 It is useful during long trips to bring sound diversity compared to your playlist, if you have one. It is also used to catch the weather information and traffic on your route. 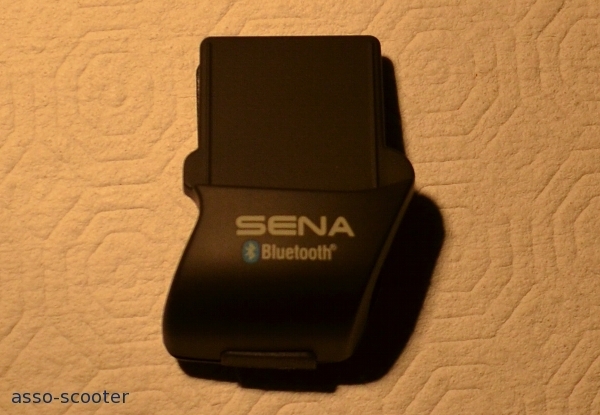 We were eager to see how Sena Technologies had added a new feature without changing the number of buttons. There is always the dial and the small button at the back. For the Smh5-FM, it changed color and became yellow. Impossible to confuse with a Smh5, without radio. It is childish to activate radio and thus navigate the module. After turning on Smh5-FM, it is necessary to press the yellow button, called ’phone button’, for two seconds. Two beeps indicate that the Fm is turned on. If you’re lucky, a station is already scanned. If this is not the case, simply press the jog dial and turn upwards or downwards to start searching for a station. Two beeps confirm that the Smh5-FM understood your search request. Each found station, Smh5-FM will dictate the frequency of the station. If the station frequency is ok and if you want to save it, simply make a long press on the jog dial. Smh5-FM understands that you want to store the frequency and makes you know. With the jog dial once again, by turning it clockwise or anti-clockwise direction to mount in reverse to get off, you select which number you want to keep this station. It is so simple. You can also, if you prefer all automatic, make Smh5-FM to scan stations. Just press twice briefly on the phone button to launch the scan. Two small beeps are heard and the scan begins, on the grid of the stations. To save a station, just a short press on the phone button. Smh5-FM confirm memory mirroring. Be careful, frequency scan saving has priority and overwrite the manually saved frequency. Finally, you have the ability to temporarily save a station. To recall a saved station, a short press on the phone button and your Smh5-FM will begin with the first preset station. There are thus ten ! It should be noted that during the search, there is no surrogate, and that the volume is constant. Without antenna as long cars have, traveling under the tunnels will cause a few cuts but we could catch a frequency under the second level of parking ! If you have an Mp3 player and are listening to your music selection, activation of the radio pauses the list. Just turn off the radio to resume reading. At worst, with the scroll wheel, you can resume playlist with the AVCRP function of Smh5-FM. With this new feature, you almost forget in Smh5-FM is also an intercom. It has a voice prompt, factory features, or with a short press on the jog dial. If your passenger is listening to the radio or music player, the intercom will cut off the sound source. It is this function that has priority. In case you have a singer as a passenger, it may be better to change the activation of the intercom. And as for the other Sena intercom devices, you can converse well with three other brand Sena intercom. Pairing with a Gps can be done according to the phone mode or multipoint with GPS overlay. 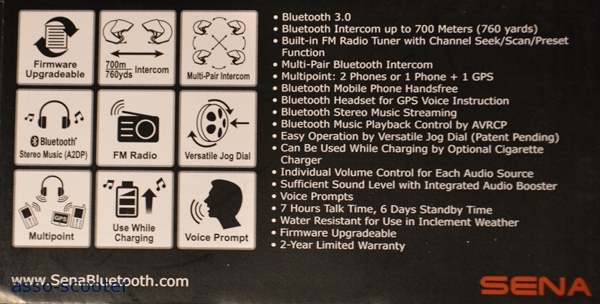 This last mode allows the Smh5-FM to connect Bluetooth to two devices. Phone and Gps, so. And if your phone Mp3 player, you get a glimpse of the possibilities of connection of the Smh5-FM. With this range of possibilities, it is essential to manage priorities. 4. (low priority) music in stereo Bluetooth. SENA announces 7 hours of battery life using the Smh5-FM. And it is indeed time that we held. Once completely discharged, it takes a little less than 3 h to recharge it through a computer’s Usb Jack. On a main socket, the charging time is practically divided by two. In standby mode, Sena announces 6 days. On this point, we believe Sena. We do not have the patience to wait six days looking the Smh5-FM, without using it. 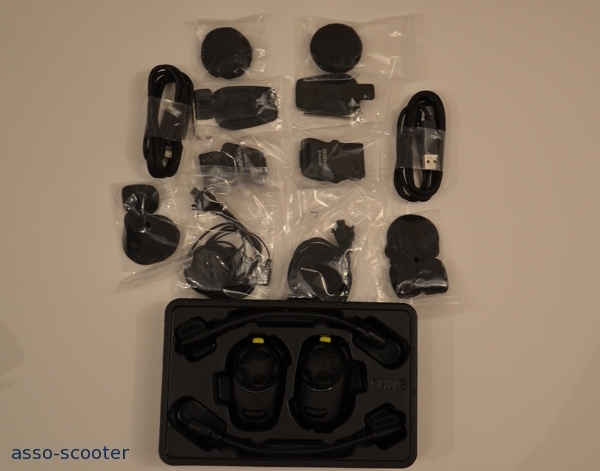 The Sena Smh5-FM is sold at the price of €149 in single pack and Dual at €289. The Smh5 is at €119 in single and € 229 in dual pack. From model to model, Sena Technologies constantly improves its products and Smh5-FM is no exception to the rule. A small computer interface that allows a direct selection of a station to store is missing at the moment. With this Smh5-FM, Dual or single, Sena Technologies high places the level for the competitors and it will certainly stay a long time still on the highest place.